It’s the fourth month of 2017 and we’re calling it. Mash-ups. Hybrids. Cross genre. Call them what you will, but it’s pretty clear to us that less and less builders are interested in conforming to typical bike categories. Our case in point? 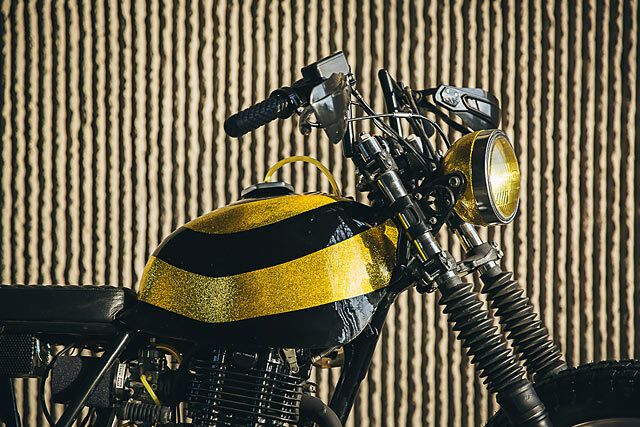 When we interview builders, more and more are refusing to classify what they’ve built, or they’re telling us, ‘It’s whatever you want it to be.’ Well, tonight it looks like we wanted it to be an enduro Yamaharley brat with a bumblebee paint job and more fork travel than a 12 foot man on a spaghetti binge. 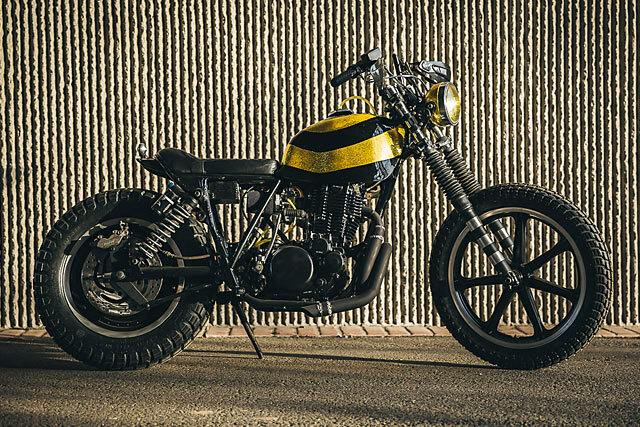 Meet Kickstart Moto’s very random, very cool ‘Plan B’ Yamaha XT500. Kick Start Garage is a family business run by Craig Marleau and his wife Jeanne. Their son, Myles, also helps out. You just might remember them from their similarly out-there ‘Taco Truck’ sidecar build from 2016. 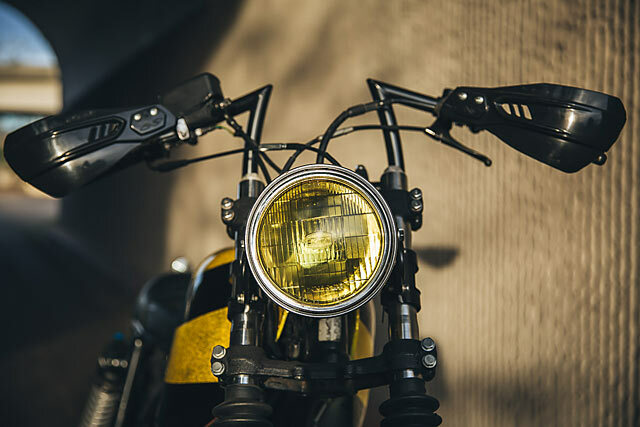 Their shop is located in Northern California near Redding, and it specialises in customs, restorations and repairs of Japanese, British and European bikes with a definite preference for the vintage gems. The build’s first step was to mod and hoop the rear frame so as to get the ‘right look’. Of course, that implies that Craig and the family had the design all figured out before they started. Now that’s saying something. 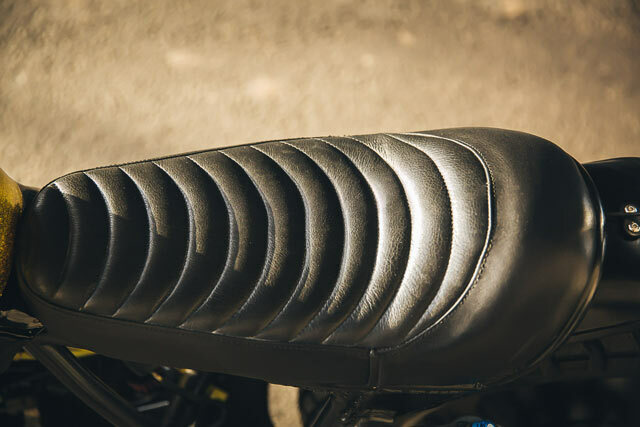 From there they made a custom seat and popped on a vintage desert tank from the 70’s that was built to fit a Yamaha TT500. Painted in Big Daddy Roth Custard Yellow metal flake, it also features a fuel sight window. Call us fashion victims, but we’ve always loved us a nice fuel window. The wheels that the fuel end sup spinning are wrapped in Allstate Tire’s ‘Dirtmans’ front and rear. The 16″ rear is the main reason for the bike’s aggressive stance. 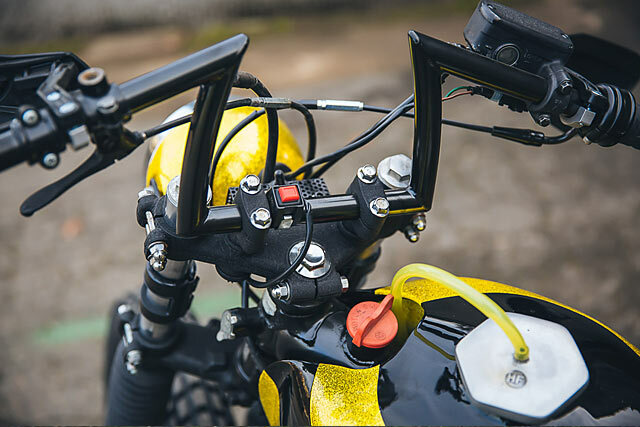 “It’s taken from a Harley Fatboy, and then we paired it with the front wheel from a Yamaha RD400.” Add to this some rear shocks from Fox Racing and the Kung-Fu’d Keystone handlebars from Biltwell and you really do have a recipe for an identity crisis. 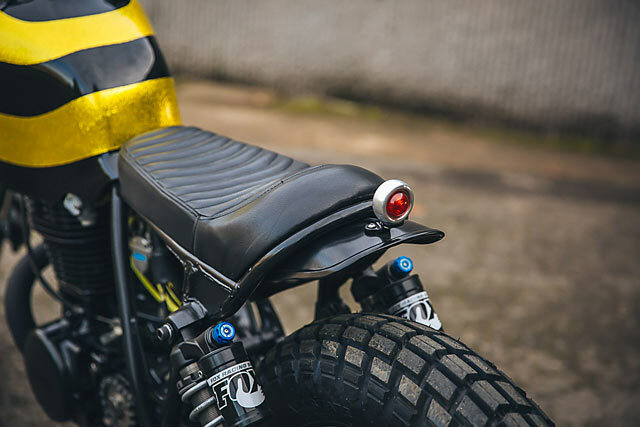 Also note the custom battery box and neat-o bobbed rear fender. 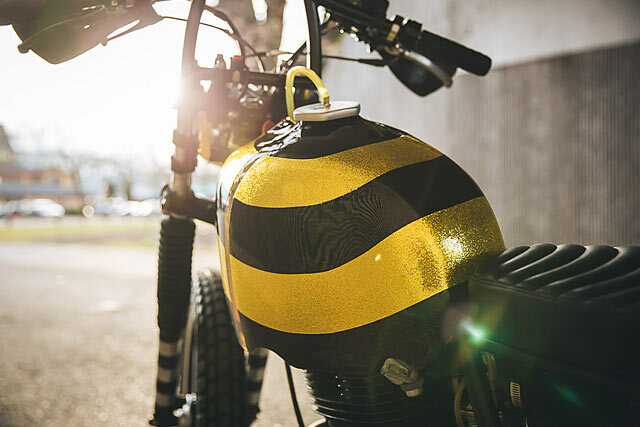 Taking its cues from the casual nature that built the rest of the bike, its bee theme evolved from nothing more complex than a casual observation that the bike’s gas cap resembled honeycomb. The brakes on the rear are from a Honda CBR600 that were supplied buy local friends at Cycle Salvage. 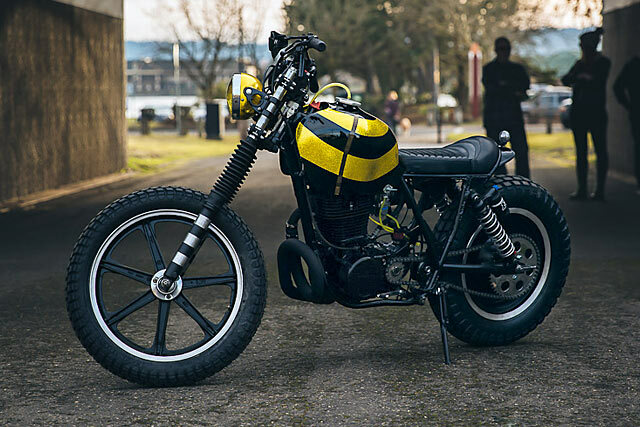 The front wheel was hijacked from a XS650 Yamaha, and the custom beehive brake light is from Prisim Cycle Supply. 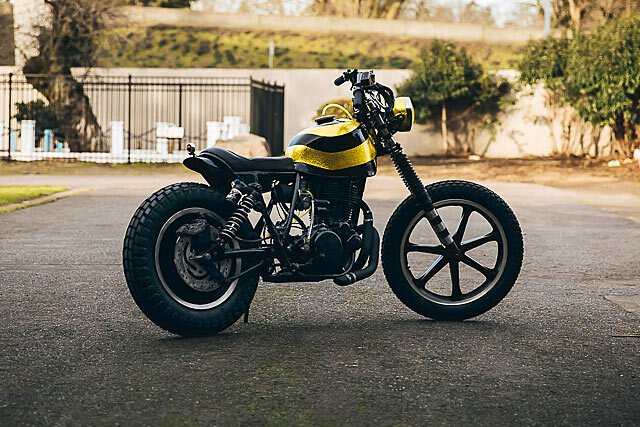 “With a shout-out to our good friend Danny Baugh, this bike was built with one intention, more fun. 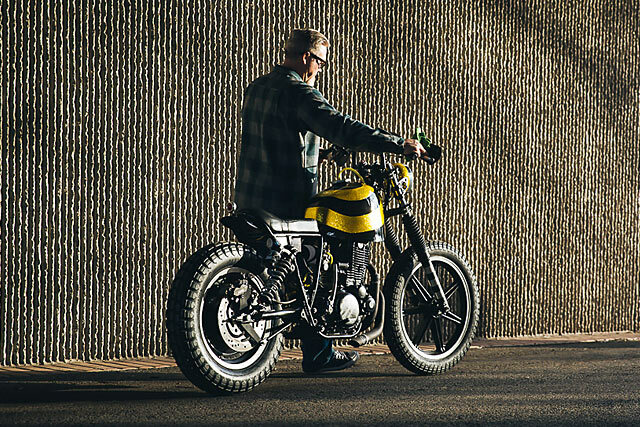 Fun to rip around town or to slide around on a dirt road.” Did someone say ‘fun?’ We hope so, because we’ve been smiling at the thought of riding this bee for days.